Something is killing the children of Lac de Thé, a tiny Québec town. No-one sees it. It leaves no evidence. The only suspect is a character from a centuries-old folk tale, and the only safety appears to depend on following the story’s ancient rule: all children must be indoors at home by seven o’clock. Now, a mysterious government agent has summoned Adam Godwinson, former priest and book dealer, to help bring an end to the deaths, but the consequences of his last brush with the unthinkable lie heavily on him, and it may be Adam who needs rescuing most of all if anything is going to be done about Bonhomme Sept-Heures. Robin Riopelle, author of Deadroads: A Novel of Supernatural Suspense, calls the book “a good, atmospheric read, filled with interesting characters” and the story’s antagonist “genuinely creepy”. Read her full review here. Bonhomme Sept-Heures is out now from Renaissance Press! You can order the book on Amazon or direct from the Renaissance web store here. You can also get it ordered in at your local bookstore, or purchase a copy at the next Renaissance Press event. I am now pleased to present the following excerpt from Bonhomme Sept-Heures. This material is copyright Evan May and Renaissance Press, 2016. All rights are reserved. No part of this text may be used or reproduced in any manner whatsoever without explicit written permission, except in the case of brief quotations for critical articles or reviews. For more information, please contact Renaissance Press at info@renaissancebookpress.com. Adam agreed and let her take the lead; they gradually distanced themselves from the main street and found themselves crunching along the sand at the town’s little beach, deserted now with the sun down. “Jane, you don’t have to convince me,” Adam assured her. “I also know that you really do want to help, not just get yourself a story.” He knew that much of Jane’s tough talk was undoubtedly necessary for successfully navigating her field, but he was a little taken aback at the change in how well she had learned it in the past years. Some of it was probably her continuing anger with him, which was a breach that would take some healing. Adam hoped that there was enough time ahead in which to do it. “Father,” Jane said softly, “what is that?” She was looking down the beach at something just visible through the deepening twilight, just where the coarse sand of the beach turned back into patchy grass and brush. His first impression was that it was a person, standing there watching them, silently. Why would anyone be doing that, though, and why would they stand so perfectly still, and so perfectly quiet? Adam briefly considered that it might be Jack Lanthier, having reconsidered the wisdom of letting him wander unescorted, or perhaps having succumbed to the boredom of the quiet motel room. But no, this figure was taller than Jack, and more slender, seeming somehow distorted or stretched thin. As Adam watched it, and perhaps it watched him, he thought he saw the glimmer of a smile, even at this distance, and something dangling in loose folds near where one of its hands would be. Some treacherous part of his brain instantly delivered the impression of a large sack of some rough fabric, now stirred gently by the night’s breeze. Did it take a step towards them? Adam wasn’t certain. “Yes,” he managed to say. “Perhaps it’s a trick of the light.” Had there been a small tree at that end of the beach, now distorted by darkness and fatigue and tortured imaginations? He couldn’t remember. He only knew that right now, he found it very hard to believe that the gaunt figure that he couldn’t shift his eyes away from was anything but terrible. At that moment, the beach was flooded with light as a massive truck, loaded with two trailers of rough logs, thundered by on the road. Its headlights swept past Adam and Jane, and then down the beach towards the thing they had both been watching, where there was abruptly no tall, thin figure, no curious little tree, and no sign of anything other than well-trodden sand and litter. Then the truck was gone, the darkness settled back in, but neither shadow nor the sense of menace and danger returned. To his immense relief, Jane didn’t appear to think the idea was at all frivolous. Adam Godwinson, former priest, isn’t sure what he believes in anymore. These days he deals in used books at a small store in Ottawa. But an old text, written in an unfamiliar language, is about to change that forever. Adam now finds himself the target of a powerful conspiracy. These shadowy figures, wielding abilities he can’t understand, want to cleanse society of its sins – even if that means destroying it. Adam will have to figure out what he believes in to have a chance to save himself and the rest of the world. Watch The King in Darkness trailer here! Geeky Godmother calls the story “big on suspense” and the story’s payoff “well worth the wait” – read the full review here. Apt. 613 recommends The King in Darkness to “anyone looking for a light paranormal mystery and adventure” and calls Adam Godwinson “a decidedly less-gritty and … endearing hero”. Read their full review here. Brandon Crilly calls The King in Darkness a “very subtle fantasy” with lifelike characters, tricks of perception, and a compelling protagonist. Read his full review here. 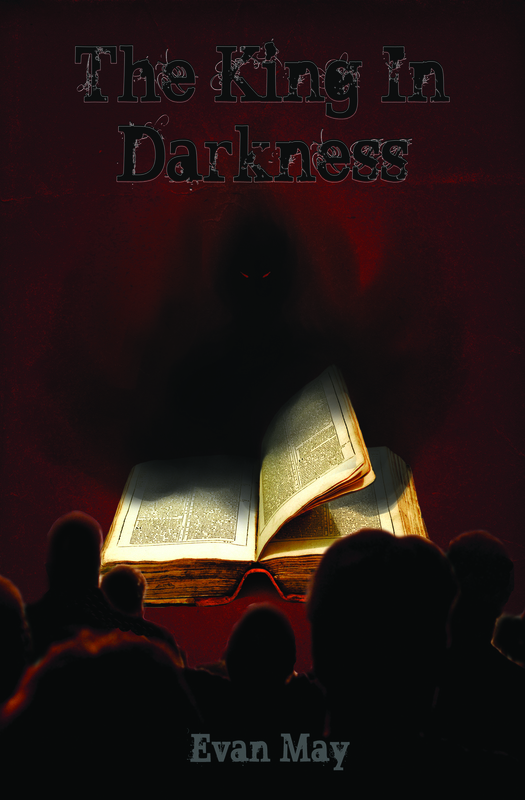 The King in Darkness is available now from Renaissance Press! You can get it on Amazon here, or direct from the Renaissance Press web store here. You can also order it from your local bookstore, or buy a copy at the next Renaissance Press event. You can also find The King in Darkness on Goodreads and interact with me there! I am now pleased to present the following excerpt from The King in Darkness. This material is copyright Evan May and Renaissance Press, 2015. All rights reserved. No part of this text may be used or reproduced in any manner whatsoever without explicit written permission except in the case of brief quotations for critical articles or reviews. For more information, please contact Renaissance Press at info@renaissancebookpress.com. Adam took the book home with him, deciding that, although W.M. Howard, Bookseller, did have a locking under-counter cabinet, it wasn’t anything really secure and there was at least some chance that Bones’ discovery had some value to it. It was certainly old, unless it was a reproduction of some kind, but old did not necessarily mean it was especially valuable. Piles of family Bibles, kept through the generations, yet worth essentially nothing to anyone who was not related to the names inscribed inside the front cover, were testimony to that. Adam occasionally had to send people away from the store with this disappointing verdict on what they were sure was a retirement package or cruise vacation unearthed from a relative’s attic or bedside table. Friday night, he went through the entire thing, cover to cover. There was nothing whatsoever to give it any context — not a drawing, table, or notation anywhere to break up the ranks of indecipherable text. There was not even numbering on the folios. Without having any way to know what had been written, the question of completeness was more or less irrelevant, but it would at least be useful to know that they were in the original order. The binding was certainly in good shape, though, which suggested the book had been kept with care, and that nothing had fallen out in the recent past. He tried holding the text up to a mirror, and turning the book ‘upside down’, not really believing that the problem was likely to be that simple, but not to have checked might come back to haunt him later. None of this provided any revelations, and Adam ended the evening quite uncertain what the ‘correct’ orientation of the book even was. On Saturday he brought it back to work with him, although originally he had planned to leave it at home rather than risking damaging it or losing it by carrying it around unnecessarily. In the end he decided that there might be time to look at it a bit during the day and it would be a pity not to take advantage. As it happened, the store was unusually busy, and by the end of it Adam had spent little time puzzling over the book. On Sunday, he took Bones’ discovery to the closest thing to an expert he knew. Along with training as a priest, Adam had studied theology. His thesis supervisor still lived in the city and was usually very pleased to have a former student drop by. Adam therefore took his strange treasure to the Sandy Hill home of Dr. Todd Marchale, still an active professor in religious studies despite a long-expressed longing for retirement. Adam hadn’t visited in a while, but Marchale had very little patience for small talk, so they focused on the book fairly quickly. “You got this where, again? One of your church kids brought it in to you?” Marchale asked this as though the whole idea was ridiculous, but Adam had learned early in their relationship that his supervisor virtually always seemed to think everything was an annoying waste of time. You could tell when he when he had really lost interest when he stopped paying any attention at all. Up until then, if it was difficult swimming against a tide of sarcasm, at least he was nearly as critical of his own ideas as he was of his students. “That’s right. He said he got it at an estate sale, and I think he was trying to give me something to do,” Adam explained, scratching one of Marchale’s platoon of cats behind the ears. They were a universally plump and spoiled bunch whose population had fluctuated significantly over the years, but Marchale’s devotion to the beasts was constant. Marchale was wearing what he virtually always did: a dress shirt — blue or grey, in this case blue — and black pants. Also, as usual, Adam briefly caught a strong unwashed odor from him. He had never been able to determine if Marchale simply forgot to bathe regularly, if it was part of some issue with saving water, or possibly deliberate disdain for social conventions. It didn’t seem to be the sort of question it was possible to ask, so Adam simply prepared himself for Marchale’s aroma whenever they had a conversation, and tried not to show any reaction to it. Sometimes he wondered if that was the point of it all — how offensive could Marchale be and still have people pretend they didn’t notice? “Something to do? I thought you were quite busy selling romance novels?” Marchale glared accusingly at Adam and, receiving no contradiction, let out a disgusted noise. “Had I but known that what you really wanted in life was to hawk Tom Clancy books, I could have saved us both a great deal of time, booted you out without having to read that bloody thesis, and all the rest of it.” This was an old issue and, in this case, Adam suspected his old professor’s disapproval was probably genuine. Adam started to deploy the opening of a well-rehearsed and well-practiced explanation. “When I decided to leave the church,” he said, only to be cut off by another noise of annoyed disgust. Marchale was shaking his head dismissively. “I don’t care if you’re not preaching, you fool,” Marchale said derisively. “But why you aren’t researching, I’ll never understand. Could even be making yourself useful around here, stick you in front of a classroom. I seem to recall you’re not a complete idiot.” In fact he had offered Adam several research assistantships over the years, but Adam had always felt these should go to graduate students working on their studies, when the need for money was usually pretty acute. Ex-students abandoning their post-graduation careers should fend for themselves. “That’s exactly the kind of insight I was hoping you’d have for me, professor,” Adam said with a smile, and was rewarded with a short bark of laughter. Marchale enjoyed being skewered almost as much as he enjoyed doing the skewering. He picked up a much-abused pipe, and started filling it with tobacco, then seemed to think better of it and discarded it among a pile of papers awaiting grading. Marchale’s students often waited a while to get their work back, and then, in many cases, wished that they hadn’t. “All right, so what next?” When Adam had worked with Walt Howard on books in the back library, they had never had to deal with an unidentified volume. The question was always determining what printing a work was, whether it was in worthwhile condition and, very occasionally, if it was genuine. This was an entirely different sort of problem. “What next? Not bloody much. Binding’s no help, doubt it’s got anything to do with British and Irish law somehow.” Marchale looked up expectantly, lightly drumming his fingers on the edge of his desk. “I’m sorry?” The professor’s train of thought was prone to veering off in unexpected and unannounced directions, to the consternation of many of his students. For Adam, this had made for more than one difficult supervisory session and more than one evening spent puzzling over comments on a thesis draft. “Substitution?” Adam asked. “Codes have never really been my thing.” Marchale shook his head as if amazed at his former student’s ignorance. “I’d be very grateful,” Adam agreed. “I’ll call you later in the week and see if we’re any the wiser?” Marchale laughed with genuine delight. Very nice sample, I enjoyed that read! Marchale’s a great creation. Thank you! He’s great fun to write.